It’s hard to argue that the BMW M3 has become a legend…an icon…and a yardstick to measure others by in the automotive enthusiasts world. Over the years BMW has made two and four door versions, as well as a convertible. But the constant through the ages (since the first E30 series version) has been the two door coupe, which is the only version currently available. It has it all: sonorous motor with class leading power, generally high level handling, and checks in all the must have boxes: proper seating position, proper shifting, excellent steering, and vault-like construction. BMW pricing ensures that it has decent cache’ as well. But, with all the goodness come issues. Two doors limit utility, and for a third of the population of the upper 48 states, it’s rear wheel drive proves troublesome when the weather turns slimy. Sure, if the kids are small enough they can fit in the back, and legitimate snow tires help but let face it, most family guys will have a tough time selling a two door rip snorting sports coupe as a ‘responsible’ decision to their better half. Audi is only too happy to supply an option: The S4, the A4s sportier brother. And for 2013, we get a sharper looking front end with cutting edge lighting, highlighted by Audi’s trademark LED daylight running lights, and HID projectors as standard equipment. An imposing sight in any rear view mirror. It’s probably a good time for your author to come clean. As the owner of an M3, as well as a very troubled Audi A4, I bring considerable baggage to this test. The Audi will have to be, shall we say, convincing if it expects to impress. Well, I won’t debate the winter issue. 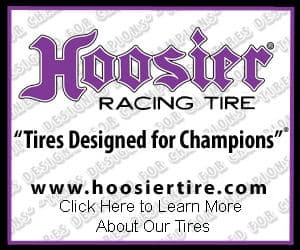 I was caught in an extremely rare early season snow storm that was predicted as all rain, and I can’t remember a race …even in the wet on dry tires…that got my heart racing as my M3 did sliding home for an hour in slush and 4″ of snow. I still thank the stars for my safe arrival. Traction control essentially limited the car to walking speeds, or maybe a jog. Full on snows would have made a significant difference no doubt, but who in CT puts on snows in early October? 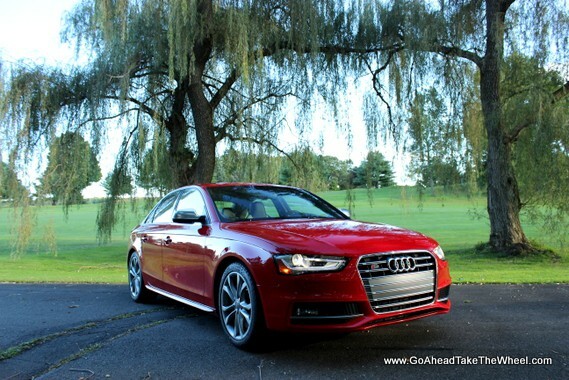 Audi solves the traction issue with its iconic all wheel drive system, Quattro, which is standard on the S4. It’s old news here: 60/40 RWD bias, and total flexibility in proportioning torque to the contact patch with traction. 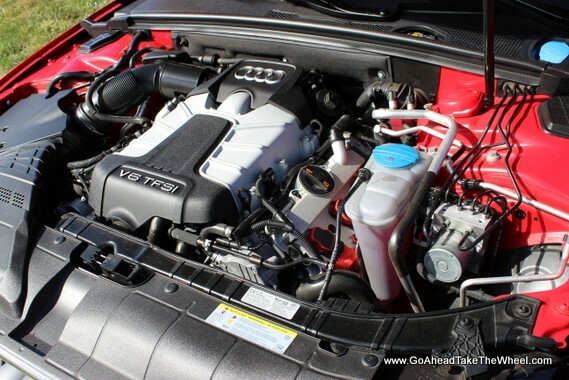 But look under the hood, and Quattro’s achilles heel becomes obvious. Little room for that important motive devise: the V6. The engine resides a papers width back from the front bumper. Indeed, most significant engine service means taking the front end off. Clearly, this is no front/mid engine Miata when it comes to weight distribution and chassis balance, and presumably, handling. But looking closer at the engine reveals a lot of aluminum and a little extra bit of kit: a supercharger so tucked in that only knowing that it’s there makes it identifiable. It’s that way in it’s effect as well: transparent. The engine pulls strongly but linearly from idle. Clutch engagement and shifter kinematics are superb. And one could be forgiven for running the engine to redline in each gear just to listen to the musical bellow from the twin pipes. Granted, the outgoing V8 was sweet, but this engine will ease the pain of the loss. It’s smaller, lighter and more efficient as well. But be watchful, I found myself hurtling along at 60 in our Radar Detector Red tester in under 5 seconds. Ok, that’s not what Audi calls their Red, but it’s not a bashful shade, and in this age of automotive color blandness the radar detector is a must in this car. Thanks to the cars solidity, and chassis refinement, you’ll find yourself rushing up on traffic constantly carrying more speed than you intend. Data geeks will have already cried foul on my M3 comparison a few paragraphs up. Yes, the M3 (the last of the current generation, we await the new gen in 2015 as an M4) will rout the S4 to 60 by 4/10ths (6/10ths with the 6 speed), and sound glorious slamming it’s two extra cylinders into a 8,300 RPM redline. (8,300!!!). So, yes, the S4 gives a up tick or two in the drag race. And it could be argued that the Audi gives up handling, steering precision and braking to the M3 as well, and you’d be right, but you’d be splitting hairs to a greater degree than you’d think. Pushing a switch on the console marked, rather obviously as “Car”, brings up the controllable parameters, such as exhaust note, steering, throttle response, and suspension calibrations. (Buried in the options are settings that manipulate the “sport differential’, and add torque vectoring to the equation). Just check “dynamic” for all. Or if, you need to sneak in late at night, go to the “individual” mode and you can make your selections ala carte’. In Dynamic, the steering is transformed, and while you won’t mistake it for an old 911, BMW F30 engineers could take a lesson. It’s electrically assisted, and we’ve been disappointed with most new electric systems that we’ve driven. The Audi was a bit of a revelation. Good weighting and reasonable feel with decent self-centering raise it above the herd. It’s on center feel could use help, but relative to it’s contemporaries, it’s rather good. While our earlier under-hood inspection revealed an engine well in front of the axle centerline, promising a ponderous handler, the weight imbalance is just not an issue on the road. 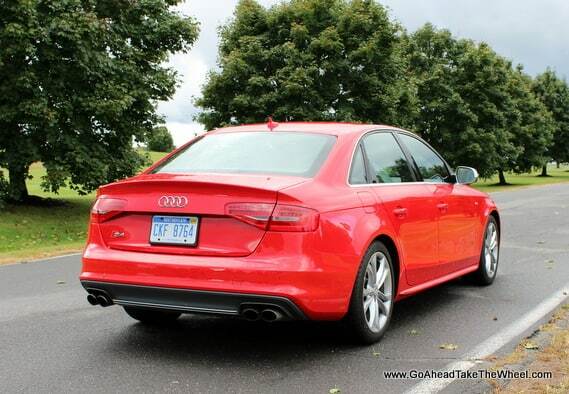 The S4 steers well, turns in great and inspires confidence, with the feel of a proper rear wheel drive sedan. High praise. “Car” mode is just the tip of the iceberg in the MMI system. Audi has made improvements to the control system and it’s probably the best of the bunch. We found our phones easy to pair, and once the knob direction was learned, operation was fairly obvious. The saving grace of such systems is keeping the most often used controls available at the touch of an easy to find button that can be triggered without navigating menu after menu. Audi has been rather shrewd here, scattering key controls in intelligent locations. Unlike, say, the new Cadillac ATS, you don’t have to get out of the seat in order to find certain buttons. The steering wheel houses a number of vital functions, and uses a roller knob to control things like radio volume. Easy to do without taking your eyes off the road. Audi has made half its new car conquests, it could be argued, on its impeccable interiors. The S4 is no exception, but truth to tell, it’s not Audi’s finest effort. Oh, it’s pretty, well crafted and put together with Nappa leather and Alacantera, but look beyond, and there’s some plastic that leaves a bit to be desired. One caveat: wind noise at highway speeds from the sunroof. If I hadn’t driven an A8 the same day we had the S4, I likely wouldn’t have noticed, but compared to the silence of the A8 the S4 sounds like an old Saab 900. But overall, it’s a great place to be, and it’s still a leader for other car makers to benchmark. 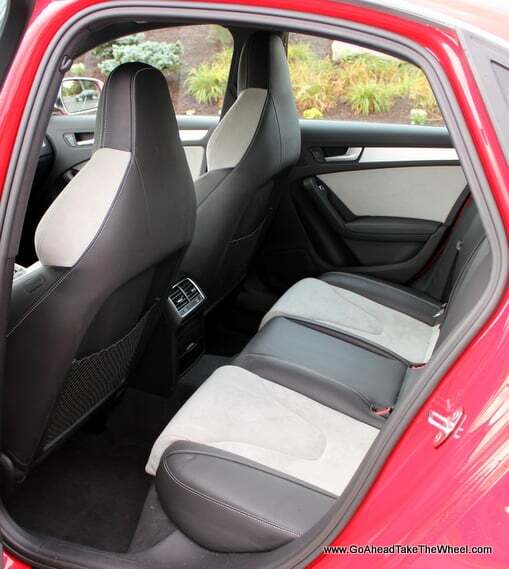 And rear seat passengers will likely not complain either as they get plenty of room and leather of their own. Of course with four aboard, a cavernous trunk is needed, and the S4 delivers, with tie downs and a ski bag. Four passengers and a ski bag? Something no M3 can really claim. Yes, they are different cars, aimed at different buyers, but while a lot of us desire an M3, a large portion of us can’t partake because of the M3’s limited focus. That’s where the S4 shines. Even to a guy jaded with an M3 in the garage, the Audi is tempting. The expected price of compromised driving dynamics just doesn’t materialize as a significant detriment. And when monetary price is considered, the tables tilt in the Audi’s favor quickly. Figure on spending about $50k for a 6-speed with adaptive drive control and the sport diff. Go crazy with upgraded navigation, spiffier wheels and such, and you can push $60K. But try to buy an M3 for $60K, much less $50K! No, $50K is now plebeian 335 territory, and the S4 is far more car.